Share your photos on Instagram with the hashtags #puppetshowtunic and #oliverands. 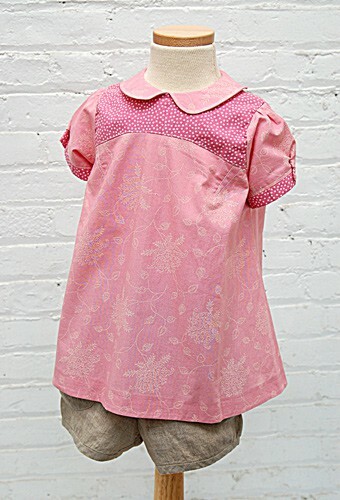 Girl's tunic or dress and bloomer shorts. 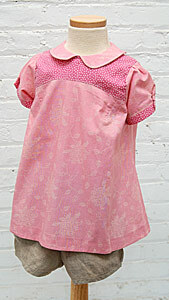 Tunic has short sleeves with narrow, buttoned cuff, curved bodice seam, and back button opening. Bloomer shorts have elasticized waist, gathered, bias-trimmed side pockets, and gathered leg opening with bias trim. After successfully sewing this pattern, you will have developed the following skills: bias binding, buttonholes, collar, darts, patch pockets, and set-in sleeves. Designed for light- to medium-weight woven fabrics like cotton broadcloth, batiste or calico, and lightweight linen, denim, chambray, or seersucker. Tunic: Eight 3/8" or 1/2" buttons. Shorts: 1 yard of 3/4" elastic. Chest 22" 23" 24" 25" 26"
Tunic Length 14 1/4" 14 3/4" 15 1/2" 16" 16 3/4"
Dress Length 18 1/2" 19" 19 3/4" 20 1/4" 20 3/4"
Shorts Hips 17 3/4" 18 1/2" 19 1/2" 20 3/4" 21 1/2"
Shorts Length 7 1/2" 7 3/4" 8" 8 1/4" 8 1/2"
Chest 26" 27" 28" 29"
Tunic Length 17 1/2" 18" 19" 20"
Dress Length 21 1/2" 22 1/2" 23 1/2" 24 1/4"
Shorts Hips 21 1/2" 23" 24 1/2" 26"
Shorts Length 8 3/4" 9" 9 3/8" 8 5/8"
I've yet to use the full pattern, but have already borrowed the sweet gathered pockets on a simple dress I made from another pattern. Looking forward to making the tunic and shorts. This is the first Oliver and S pattern I made and I love it. Great instructions and beautiful shorts. I have made them many times for my granddaughter. I enjoy the clever design, clear instructions and accuracy of these patterns, but there’s more! The pattern encourages me to try out a few different techniques, which means I am developing my skills. Great pattern: lovely tunic and shorts! I'm an intermediate sewer and found this pattern easy to follow. I do think that there may be a way to simplify some of the gathering processes in the shorts and I'm thinking of using fold over elastic for the binding of the pockets. My daughter loves hers and they look very professional. Lots of variations possible. I bought this pattern for the shorts. My 5 year old daughter has skinny legs and this style has the bottom of the legs cinched in, so is much more modest for her. They look perfect. And those pockets won her over! I'd like to make the dress as well before she grows out of the sizing. Thank you for this pattern...I made 2 pairs in a smaller size last summer for my daughter and constantly was asked where I bought them. I made 4 pairs this summer. They are awesome in Kaufman yarn dyed linen/cotton. I batch cut 4 pairs in about 2 hours and each pair can be sewn up in about 1.5 hrs.The perfect project for unwinding after bedtime for FT working moms. I bought this pattern because I needed shorts for my little girl's summer wardrobe. I have not made the dress. I have been sewing for about 18 months and I put the shorts together without any trouble. They are SO cute and they seem comfortable. The pattern is also very clear and well-written, I found it very easy to put together. My only disappointment is that the sizing seems to run really small. My daughter is 16 months old so I bought the smaller pattern for her (she is very small for her age - in the 15th percentile). It was so small she couldn't get her legs in! I managed to work out how to enlarge it a bit but I would have been better off buying the larger sizes to start with. Annoying. I'm a PDF pattern convert! The pattern turned out great. I did the shorts in a medium-weight linen, and the shirt in a quilting cotton. I piped the collar and the curved front part. I would make it a little less trapeze-dress like--it's VERY loose fitting. I also finished all the seams with french seams. I like Oliver + S patterns because they often use linings and finish seams, so I wish all seams had been finished (and what is the best way to finish a seam on a gathered sleeve? i do not like serged/zig zag seams). I was very hesitant about the pdf patterns--I like the quality of the paper patterns, and was worried the printing and assembly would be a hassle. I was wrong! I actually PREFER the pdf patterns, as I don't have to trace the patterns (I don't cut them so that I can use multiple sizes). I am terribly old-fashioned in all ways relating to technology, and you have managed to convert me! This pattern is well written and is good for sewers with experience. I am almost done with my first dress and will be making more. I made the digital puppet show shorts for my first grandchild. 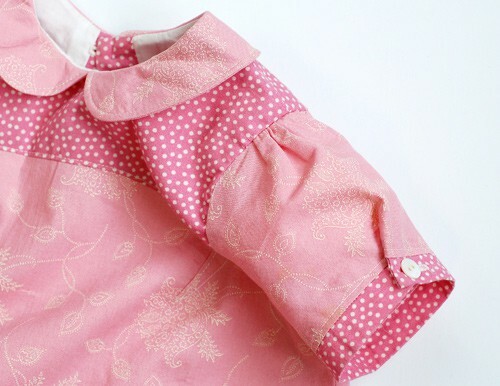 I have made adult clothes before and clothes fro my children, but have never sewn for babies. IT FITTED PERFECTLY and they are so cute. These shorts were so easy to sew and look so cute on my DD. She can't for it to get warmer so she can wear them. Just wish I had found them before now since I am making the five! I made the Puppet Show Tunic for my grand daughter for Valentine's Day. I did it on a blue chambray with two little lady bugs leaving a heart trail embroidered on the front. I love it and my daughter did too! I can't wait to sew the shorts for the summer! All I can say is, Oliver + S patterns, where have you been all my life? LOL! These shorts are super cute! I used the digital pattern to sew shorts for my petite 7yo girl. The digital file was easy to assemble and the shorts came together beautifully. I love the details: the gathered pockets, the narrow cuff. I only wish the pattern went up to higher sizes! I have made 3 of these tops for my 5 yo. The only draw back for an independent little girl is that she can't reach the buttons to do it up her self, but she loves wearing them. I added an inch to the shorts length and it worked well. Those pockets are so cute. And as always the instructions are comprehensive. I just finished this up for my almost two year old. I love it and I expect I will make several more. I read the reviews before I cut it out, so I measured my child carefully, including her thighs to make sure to make the right size. I made a size 2 for my 26 pound, 33 inch tall 22 month old. Her measurements on the Oliver and S size chart ranged from 12-18 month (waist and weight) to size 2 (height), so I thought the 2 would be a safe bet. The tunic is a bit large (great- room to grow!). The shorts fit, but I would prefer more ease or something. I don't think they will fit her for long. Next time I plan to make the size 3 shorts or use a smaller seam allowance all around. Definitely worth a second try. Also, Oliver and S has the best digital downloads. I have several of the paper patterns and am tempted to re-purchase them as digital. I like to print the instructions and bind them into a book. Makes it easy to refer to while sewing! Shorts-Yes, But don't forget the Dress? Its a beautiful dress. I made it for my daughter to wear to kindy and it makes me smile every single time I see it on her. This pattern is a little trickier (then the others) and its not one to rush but it is so worth the effort to sew. If you are nervous, sew along with me. http://fiveandcounting-motherof5.blogspot.com.au/2013/02/a-puppet-show-for-kindy-part-one.html I found there was plenty of bias strip for the hem so double check that before cutting your precious Liberty. The shorts are cute and very popular. I really like the look of the flat front version illustrated on the packet front so I did a little tute for that. http://fiveandcounting-motherof5.blogspot.com.au/2013/02/puppet-show-shorts-tutorial.html A classic little tunic and shorts which I think would look so cute as a newborn set for a baby boy too. Imagine it in tartan for a wedding or pure white as a naming day ensemble. The internet sewing world was a happier place when these shorts were released as a digital pattern. 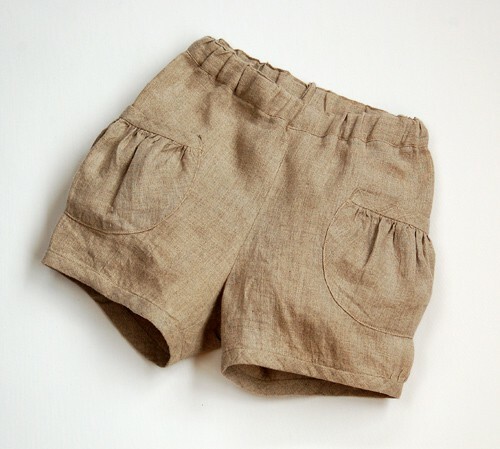 These shorts are a summer staple at our house! So, so cute! I have only made the dress once, but this just reminds me I need to make it again! Such a cute, classic look. I found Oliver + S just after this pattern was released digitally and it was the first one I purchased. Personally I prefer paper patterns but as it was impossible to find any longer I purchased the pdf, I was so impressed with it! Oliver + S digital patterns are literally the best I have ever seen. I discovered Oliver + S when my surprise baby was born nearly 4 years ago. I had been sewing for my older 4 children for nearly 20 years and could not be more satisfied with this and the other half dozen Oliver + S patterns that I've tried. I was one of those breathlessly awaiting the digital release and have made 2 shirts and 5 pairs of shorts with it. It fits beautifully on toddlers and little girls. The instructions are excellent, and with each pattern I've learned a new technique that really kicks my sewing up a notch. Perfect instructions, tricky small sizes. This was the first Oliver + S pattern I used and almost the first sewing I did. Definitely diving in the deep end as there are plenty of tricky parts in the blouse but the instructions were superb and while I was slow, the end result was a beautiful outfit. 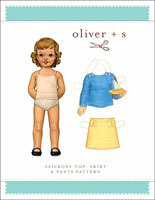 This pattern began my love affair with Oliver + S and sewing for kids. Sadly it didn't fit the intended child. I've found the smallest sizes tend to run a bit small and the neck and sleeve cuffs have been too tight for the intended babies. My own daughter at 9 months could only just squeeze into the 12-18m size. The 18-24 months shorts could barely be dragged over her thighs at about 12 months. Measure carefully, as those chubby baby arms and legs could prevent your gorgeous outfit being worn, and almost certainly not one for the cloth nappie-d baby. The one that started the PDF ball rolling! If you were around in the online sewing world before O+S began their digital releases, you will remember that you couldn't post a photo of a garment you'd made from this pattern without being inundated with requests. When this went OOP (out of print) it became a holy grail of patterns and it seemed that every week there was a new thread in the forums asking for hints or tips on where you could beg, borrow, or steal a copy. Well, lucky you: it's now available digitally, and yes, those famous shorts really are *that* great. Don't overlook that fabulous blouse with its classic styling which has provided the base for everything from fresh, clean white blouses to Disney style costumes. By the time I was done with the rounded collar and slightly puffed sleeves I felt as though I was really ready to tackle almost any project. The instructions carefully guided me through gathering, sleeves, collar construction, button placket, and bias binding. That's a whole lot of technique all beautifully explained and shown, in a single pattern. Please note that all errata have been corrected in the digital version of this pattern. These notes apply only to the printed version of the pattern. The first printed version of this pattern contained an error on pattern piece 15. You should trim 1 1/2" from one end of piece #15, the Bias Leg Trim, maintaining the same angle as the original piece. This adjustment should be made for all sizes as in the illustration shown below. This error has been corrected in the second printing of the pattern and in the digital version that is being sold now on our website. 8 3/4" 9 5/8" 10 3/8" 11" 11 3/4" 12 1/8" 12 7/8" 13 5/8" 14 3/8"
This error has been corrected in the second printing of the pattern and in the digital version that is being sold now on our website. Discussion on the digital puppet show tunic, dress + shorts sewing pattern from the Oliver + S Discussion Forums. Find and share more photos on Instagram using the hashtags #puppetshowtunic and #oliverands.